This elegant apartment building was erected in 1929 and occupies a thin, trapezoidal plot along the East River and the FDR Drive. 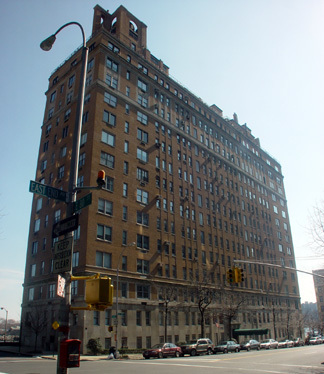 The 14-story building was designed by Pleasants Pennington and Albert W. Lewis in association with McKim, Mead & White. 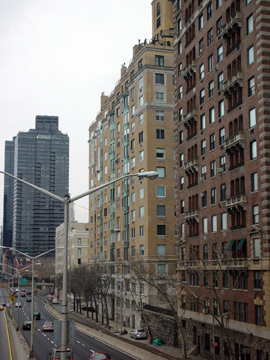 The building, which is one of the most attractive on East End Avenue, used to also front on Marie Curie Avenue, which was removed to accommodate the FDR Drive. The building is only 29 feet wide at the south end, where there is an entrance to the FDR Drive, and 51 feet wide at the north end, which is only a few blocks from the very attractive Carl Schurz Park, which contains Gracie Mansion, the Mayors Residence, and a riverfront promenade. Some of the citys finest private schools are also nearby. The building has fine East River views, of course, but also many good views to the south and west because the nearby buildings are low-rise. In their fine book, "New York 1930, Architecture and Urbanism Between The Two World Wars," (Rizzoli International Publications, Inc., 1987), Robert A. M. Stern, Gregory Gilmartin and Thomas Mellins note that "The building consisted of three stacks of apartments: the center units were duplexes exclusively." "In contrast to the severely rectilinear street facades," they continued, "the building's riverside elevation was articulated to accommodate the diagonal property line and provide numerous bay windows as well as balconies from which tenants could take full advantage of the magnificent river views." In a September 2, 2007 article in The New York Times, Christopher Gray wrote that the building "produced a chaste, aristocratic, nearly styleless building of soft orange, brick, and limestone with four projecting window bays on the East River Side," adding that "the narrow southern end of the building looks like a ship's prow" and that "the living rooms there are 27 feet across, and each one must feel like the bridge of an aircraft carrier." There is an entrance to the FDR Drive south at 79th Street where there is also the full-block model tenement project known as City & Suburban Homes. This building has no health club and no garage and there is considerable traffic noise.